When it comes to controlling spend and minimizing risk, sourcing and contract management are both key. But outdated processes and manual methods can be cumbersome, inefficient, and likely to result in errors. New technology offers businesses a better way by automating processes to drive efficiency and visibility while minimizing risk. 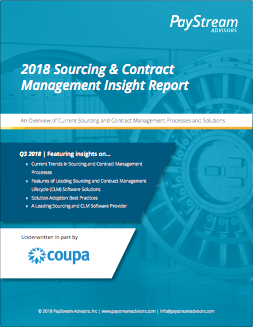 Despite growing awareness of eSourcing, contract lifecycle management (CLM), and comprehensive Source-to-Settle (S2S) software solutions, enterprise adoption remains relatively low. To bridge this gap, PayStream Advisors put together this report exploring the current state of sourcing and contract management in various industries, process pain points, and how automation can deliver real value by driving end-to-end efficiency.